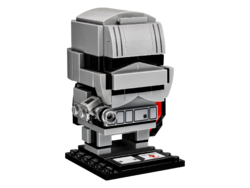 41486 Captain Phasma is a Star Wars BrickHeadz set released on November 1, 2017. This LEGO® BrickHeadz construction character featuring Captain Phasma™ is fun to build using colorful LEGO bricks that recreate all of her iconic details from the blockbuster Star Wars: The Force Awakens movie, including Stormtrooper armor, helmet and a buildable cape. She also has a detachable blaster pistol and stands on a buildable collector’s baseplate with BrickHeadz icon for easy display in your home, office or anywhere you like. 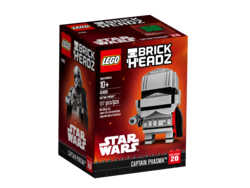 Buildable LEGO® BrickHeadz construction character featuring Captain Phasma™ has authentic details from the blockbuster Star Wars: The Force Awakens movie, including iconic First Order Stormtrooper armor and helmet, buildable cape and a detachable blaster pistol. Have fun growing your LEGO® BrickHeadz collection with other characters from the blockbuster Star Wars saga, and many more from your favorite Star Wars films, TV series, games and comics. Facts about "41486 Captain Phasma"
This page was last edited on 3 November 2017, at 11:12.